The park is located less than a three hour drive from the San Francisco Bay Area, eight miles northwest of Boonville, a half-mile south of Highway 128 on Philo-Greenwood Road. The park is located on one of the scenic by-ways, the Greenwood Road, in southwestern Mendocino County just off State Highway 128. Currently the front portion of the Azalea loop of Hendy Woods State Parks Campground is open on a first come first serve basis. Starting Jan 1st, 2019 there will be sites in the Azalea loop on reservations year round. Reservations can be made through reservecalifornia.com or by calling 1-800-444-7275. For further information please contact the Sonoma Mendocino District Office at (707) 937-5804 Monday - Friday 8:00 a.m. to 5:00 p.m.
Until further notice Hendy Woods State Park will contain areas where services are reduced or eliminated. For further information please contact the Sonoma Mendocino District Office at (707) 937-5804 Monday - Friday 8:00 a.m. to 5:00 p.m.
Less than three hours from San Francisco in the heart of the Anderson Valley wine region, Hendy Woods State Park protects two groves of towering redwoods. Some of its trees may be more than 300 feet tall and 1,000 years old. Five miles of trails, including Big Hendy Grove’s wheelchair-accessible Discovery Trail, lead through the fern-filled forest. To reach the park, drive 8 miles northwest of Boonville on Highway 128. Turn left on Philo-Greenwood Road. In 0.5 miles, turn left at the Hendy Woods State Park sign and proceed 0.2 miles to the ranger station. Warmer and less foggy than most redwood parks along the coast, Hendy Woods is a popular spot for swimming in the summer and canoeing and kayaking in late winter and early spring. The park is also known for the Hendy Hermit, a Russian immigrant who lived near the park for 18 years. Open year-round for camping and day use, four cabins and 92 campsites are available year round. 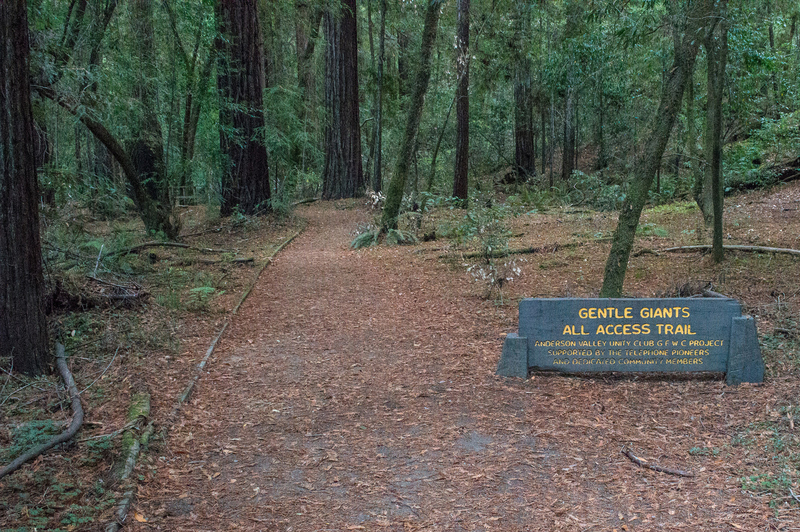 The park’s gentle trails lead through a spacious riverside meadow and the skyscraping redwoods of the Big Hendy and Little Hendy groves. The meadow (day-use) area has two shade ramadas, several picnic tables, barbecues, and bathroom facilities—all are wheelchair accessible. In the woods between the two old-growth groves, visitors can camp, stay in cabins, attend programs at the campfire center, or (during certain hours) get souvenirs, supplies, and information at a small, volunteer-staffed visitor center. If you have an hour, hike the 0.6-mile wheelchair-accessible Discovery Trail through Big Hendy Grove to see the park’s finest old-growth coast redwoods. decades in the middle of the last century. A bit farther down the trail is another of his improvised dwellings and a fascinating interpretive sign. If you have a full day, explore Big Hendy, Little Hendy, and the hermit huts; picnic beside the river; and sleep beneath the stars at one of the park’s woodsy, well-maintained campgrounds. • Dogs must be on a leash no longer than six feet and in a tent or vehicle at night (Please carry proof of rabies inoculation). Except for service animals, dogs are not allowed on trails. • Build fires only in the camp or picnic stoves provided. • Do not gather dead wood. It enriches the soil for surrounding vegetation. 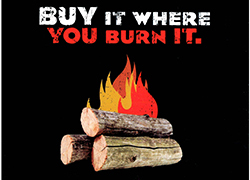 You may purchase firewood at the ranger station or from the camp host. • Bicycles are restricted to paved roads. High and low temperatures between November and March can range from the high 50s to the low 30s at night. From April through October, daytime temperatures range from the low 60s to low 100s, and from the low 40s to the low 50s at night. • The Azalea Loop: four campsites; restroom accessibility varies. • The All-Access Trail near the day-use area, about one-half mile long. • One-room Puma Cabin at Wildcat Campground has a ramp, with accessible restrooms nearby. • The day-use area, opened in 2015, and its two ramadas with barbecues; bathroom building; drinking fountain and faucet; interpretive signs explaining natural, cultural, and recreational points of interest; concrete paths that connect visitor facilities; ADA-compliant parking. For additional information, visitors are encouraged to click on the accessible features link at the top right of this page. Visitors need to be advised that periodically early morning noise and agricultural spraying occurs adjacent to the park.